Veterinary visits can be expensive and these do-it-yourself therapies and homeopathic remedies that work for knowledgeable dog breeders may help your dog. When it comes to our companions, nothing is too good for them. We buy the best foods, groom them, make sure their teeth are shiny, as well as having regular Vet visits. Many of us wonder if there is more we can do because trips to the veterinarian (1) can be expensive, and while the following are by no means a miracle cure for any ailment your dog may have, some of these alternatives may help. VITAMIN E: Give orally, rub into your dog’s skin, or put into his bath water for dry skin. Be sure to check with your veterinarian for the dosage before giving orally. FLAVORLESS ELECTROLYTES: Such as Propel™ can help your dog or puppy replenish lost fluids after an illness or bout of diarrhea. PLAIN YOGURT: Is a great way to kick start the good bacteria in your dog’s stomach and kill bad bacteria, especially if your dog has been on anti-biotics (kills the good stuff too). 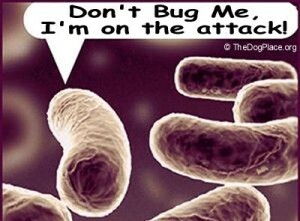 Good bacteria in yogurt keeps infections away! CHAMOMILE TEA: For itchy spots, brew up a pot, let cool, place in a spray bottle and refrigerate. Spray on the affected area to sooth the itch! It is also good for upset tummies, gas and anxiety. Placing WARM, NOT HOT tea bags on eyelids can sooth irritated eyes in dogs and people. PULSATILLA NIGRICANS: aka Windflower, homeopathic used for Separation anxiety, self -mutilation and destructive behavior when left alone. RHUS TOXICONDENDRON: aka poison ivy, homeopathic used for joint pain and arthritis. HEPAR SULPHURCUM: Homeopathic used for infections- Helps wounds come to a head and drain, mastitis, tooth abscess and hot spots.Use one dose every 8-10 hours until drainage occurs. IVERMECTIN PASTE HORSE WORMER: Even the $2 tube will work! Use one dosage click a month, given orally to your dog to prevent heartworm. Mine like apple flavor. ITCHY TIP: Mix a small amount of the same Ivermectin paste horse wormer with anti- itch/antibiotic cream and put on hot spots. They will clear up in no time! Be sure you clip around the area so it can air dry. HEART DISEASE: Vitamin E, B Complex, Chromium and Selenium. Also helpful are Amino Acids such as L-Carnitine and Taurine for congestive heart failure, L-Carnitine aids fat processing while Taurine protects the heart from too much calcium and enhances cell membranes. 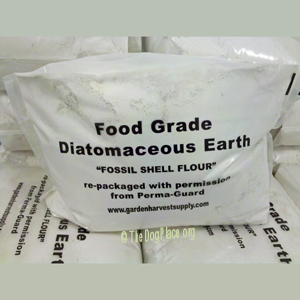 FOOD GRADE DIATOMACEOUS EARTH: aka DE, you should only use Food Grade for yourself and your pets, as any other type is used for garden soil and pool filters and is toxic. Diatomaceous Earth (DE) can rid your pet of Round, Whip, Pin, and Hook worms in about 7 days. Feed it for 30 days to kill all new hatchlings . I use broth to make up “mud” and add it to their food. They have no problem at all eating it. AND it works!! Use twice a year for indoor dogs. If your dogs are outside and catch their own snacks, do it at least every 3 months. DE also absorbs Methyl Mercury, E-Coli, Endotoxins, Viruses, Organophosphate pest residue, drug residue and proteins. Dosage is 1 Tablespoon per day in food for dogs OVER 55 lbs, and 1 teaspoon a day for small dogs and puppies. You may also sprinkle lightly in your dogs fur, rubbing it into the skin, and lightly sprinkle on and around its bedding to rid them of fleas and ticks. So, what the heck IS diatomaceous earth? It is the skeletal remains of tiny amoeba’s found in fresh water and harvested, processed and sold for animal and human use. Once crushed, the little critters look like shards of glass, which scrape down the sides of worms, scoring them. When this happens, the worms dry out and die. Nothing happens to your pet but good things!! No more worms!! It has another good use too, see #2 below. THUJA OCCIDENTALIS comes from the White Cedar Tree. Using leaves and twigs, containing flavonoids, glycosides, mucilage and volatile oils ( Thulone, Borneal, Camphor, Fenchone, Limonene, Myrcene, and Pinene). It is used as an anthelmintic, expectorant and stimulates smooth muscles. Many use it before or after vaccinations to help cells withstand multi-valent vaccines, and for the removal of warts. It can also be used for the removal and shrinkage of Epuli (gum tumors frequently seen in Boxers). COCONUT OIL: Natures Delicious Wonder! Coconut oil aids in digestion, improves coats, and prevents infections. Coconut oil is 90% Saturated Fat, and one of the few fats classified as a “Super Food”. Medium Chain Triglycerides aka MCT’s, are GOOD fats. Made up of Lauric Acid, Capric Acid, Caprylic Acid, Myristic Acid and Palmitic, it contains 2% Linoluric Acid (polyunsaturated fatty acid) and around 6% Oleic Acid (monounsaturated fatty acids). The Lauric Acid in coconut oil has Anti Fungal, Anti Viral and Anti Bacterial properties. Capric and Caprylic Acid are best known for their Anti Fungal properties, but also have some of the same benefits as Lauric Acid. MCT’s (Medium Chain Triglycerides) metabolize well to provide a quick burst of energy for performance, endurance, or working dogs. It also aides in weight loss and balances the thyroid. How much do you feed? Rule of thumb is : ¼ teaspoon for small dogs or pups per day. 1 teaspoon for large dogs for large dogs per day to start. After they have adjusted to the oil, increase to: 1 teaspoon per 10 pounds, or 1 Tablespoon per 30 pounds. If your dog has oily stools or diarrhea, stop the oil, and begin again after stools become normal with a smaller dose. CALCAREA CARBONICA AND CALCAREA FLUORICA 30c - aka- Calcium Carbonate, Oyster Shell, Mother of Pearl, Carbonate of Lime. Used to reduce gum inflammation and overgrowth, and reduce size of epuli (gum tumors). what is this? Dose- 1 pill 2 times daily, for 3 days, then wait 10 days to see if it has made an improvement. If not, repeat or use another type of treatment. CANCER HELP: There is a canine cancer remission therapy developed by Vera Anderson in 2004 that has proven quite effective with most dogs. This treatment is used to put cancer in remission, shrink tumors and epuli using a combination of Tagamet and Benadryl. Please see the website www.VeraBoxers.com/cancer.asp for information on results and treatment protocol. This therapy is being used in over 15 countries with thousands of dogs now living 1.5 to 4 years longer than veterinarians expected. Vera's contact information can be accessed on that webpage. This treatment WORKS!! I have spoken with many people who have had their dogs on it, and seen the tumors shrink, and disappear. It may not be a miracle, but gives hope! Please share with your veterinarians, your friends and all other dog people who need a bit of light at the end of the tunnel. I have my senior dogs on it as a preventative. NOSODES: Rather than traditional vaccinations, some pet owners are now electing to give Nosodes, which are based on geographical living areas, health, age and condition of your pet. 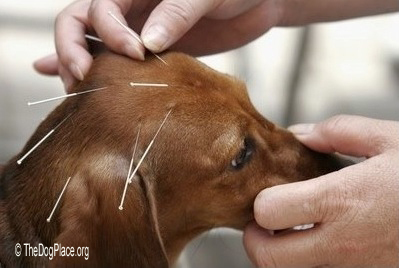 ACUPUNCTURE: The use of fine needles to realign the body’snatural energies to help heal itself. Sometimes herbs and electrical stimulation are used to enhance the use of the treatment. Most pets sleep through the treatment. Used for arthritis, injuries, anxiety, digestive and many more problems. CHIROPRACTIC: Sometimes a hard bump by a playmate, jumping over a wall during Agility, or having a long back can cause our buddies to get out of alignment. Gentle manipulation can relieve the pain, and stop damage to delicate nerves in the spine. We all want the best for our four footed friends. Before using any of the above please do further research into the health issue of your pet, the use of the medication, dosage and ill effects, if any. Being informed of alternatives to traditional medicines is always wise. People were using what we call weeds for medicinal purposes long before we discovered certain plans, and even mold was a good thing! There are many, many more out there, too many for me to put in one column, so I will see you around the ring!! 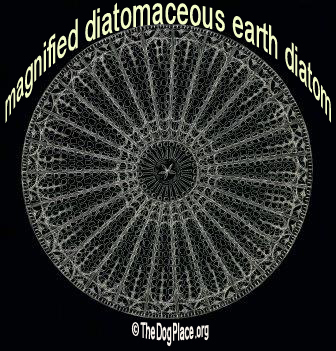 Diatomaceous Earth, says it cures everything, tested it with my dogs. 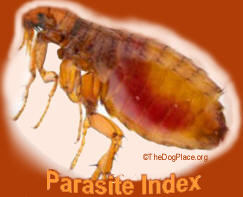 Facts on natural flea prevention (like diatomaceous earth) vs pesticides.